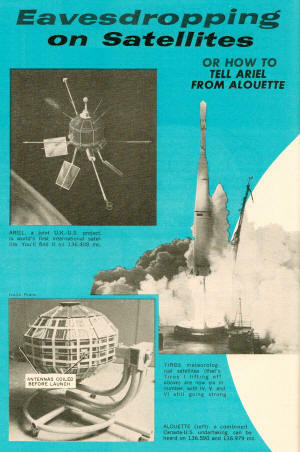 1963 was five years since America's first communications satellite, Echo, was placed in orbit. Echo was a passive, spherical reflector that merely provided a good reflective surface for bouncing radio signals off of. By 1963, the space race was well underway and active communications satellites were being launched at a rapid pace. Spotting and tracking satellites has long been a popular pastime with two types of hobbyists: amateur astronomers using telescopes and binoculars, and amateur radio operators using antennas and receivers. With at least six easy-to-snag NASA satellites in the 136-137 mc. band, there's no time like right now to start pulling them in. How? Well, a receiver offers no real problem-your present communications set can be made to tune the 136-mc. band simply by adding a converter. 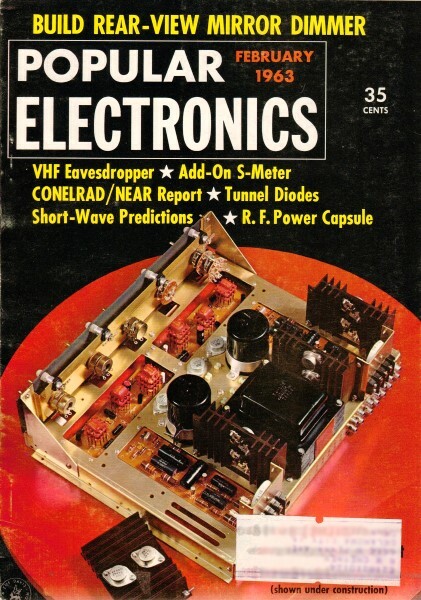 And, you can either modify an existing converter designed to cover the 2-meter ham band, or, better yet, you can build the special "NASA 136" for this very purpose (for full details, see the June 1962 issue of POPULAR ELECTRONICS, p. 39). Fortunately, too, a large and elaborate antenna system is NOT necessary at these frequencies. In fact, near overhead passes can be picked up with a 3' 7" dipole, and you may even get satisfactory results with a TV antenna. Start by listening for the Tiros satellites, since their signals are moderately strong. With your antenna pointed SE or SW (in the U.S.), set your receiver for c.w. reception, use a medium i.f. selectivity, and tune to 136.230 mc. If your converter and receiver calibration aren't spot on, tune around the satellite's frequency every five minutes or so, listening carefully for a weak carrier. An accurate receiver can be left on the frequency until the carrier appears, although it could take up to 12 hours for you to hear the first pass. A single, low-orbit satellite can be heard for up to seven successive passes, followed by a 12-hour quiet period; the exact sequence will depend to some extent on your location and system sensitivity. Once you pick up the carrier, change to a narrow i.f., use a Q-multiplier, or try any of the other tricks you may have for receiving very weak signals. (2) A satellite will appear to be slightly high in frequency when ap­proaching, slightly low when receding. This Doppler effect will vary from nearly zero for a distant pass to about 7 kc. for an over­head pass, and it's one sure way to identify a satellite. (3) Low-orbit (750-mile or so) satellites will be heard for only about 18 minutes during each pass-usually considerably less. (5) Most satellites are modulated by telemetry equipment. This modu­lation may be quite weak, and audible only on near overhead passes. Now that you know how and where to listen, you'll also want to know what satellites to listen for. There are at least six, as we mentioned, of which the Tiros group are especially good bets. Here they are, listed in order of ascending frequency. Telstar. Frequency, 136.050 mc. ; pe­riod, 157.7 minutes; altitude, 590-3500 miles. Telemetry on several very weak subcarriers. Long period and high alti­tude make Telstar difficult to catch . Tiros IV, V, VI. Frequencies, (IV) 136.230 and 136.920 mc., (V and VI) 136.235 and 136.922 mc. ; period, (IV and V) 100.5 minutes, (VI) 98.7 minutes; al­titude, 420-520 miles. Telemetry on weak subcarriers 1 kc. above and below carrier. Tiros satellites are moderately strong and pass frequently. Weather map pictures are transmitted on a higher band. Ariel. Frequency, 136.408 mc. ; period, 100.8 minutes; altitude, 247-750 miles. Telemetry sounds like clanking chains, out to ±15 kc. Ariel's modulation is keyed from the ground and is not always present. Ariel is believed to have suf­fered major solar cell damage from ra­diation belts and is transmitting er­ratically. Alouette. Frequencies, 136.590 and 136.979 mc. ; period, 105.5 minutes; altitude, 600 miles. Telemetry on multitone subcarriers out to ±20 kc. A wide as­sortment of beeps and clanks makes Alouette one of the most interesting satellites to log. Other satellites in the NASA band are probably commanded from the ground and are very elusive. But get Alouette, Ariel, Telstar, and Tiros (IV, V, and VI!) in your log before you start think­ing about snatching any of the hard ones!